Namibie, offeecially the Republic o Namibie is a kintra in sooth wast Africae on the Atlantic coast. It haes mairches wi Angola, Zambia, an Zimbabwe tae the north, Botswana tae the east an Sooth Africae tae the sooth. It wis unthirled frae Sooth Africae 1990. Afore that, it wis cried Sooth West Africae. Its caipital is cried Windhoek. Tourism an diamant minin is verra important tae the Namibian economy. Afore Warld War I Namibie wis a German colony. German is still widely spake in the kintra, thou Inglis is the offeecial leid. ↑ "Communal Land Reform Act, German" (PDF). Government of Namibia. Retrieved 18 February 2016. ↑ "Communal Land Reform Act, Otjiherero" (PDF). Government of Namibia. Retrieved 18 February 2016. ↑ "Communal Land Reform Act, Oshiwambo" (PDF). Government of Namibia. Retrieved 18 February 2016. ↑ Shugart, Matthew Søberg (September 2005). "Semi-Presidential Systems: Dual Executive and Mixed Authority Patterns" (PDF). Graduate School of International Relations and Pacific Studies. United States: University of California, San Diego. Archived frae the oreeginal (PDF) on 19 August 2008. Retrieved 4 September 2016. ↑ "National Council". Parliament.gov.na (in Spaingie). Retrieved 2017-08-26. 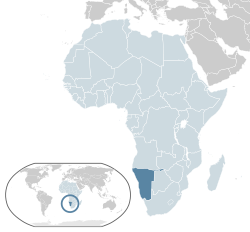 ↑ "CountryMeters – Namibia population". CountryMeters. Archived frae the oreeginal on 7 February 2018. Retrieved 7 February 2018. ↑ "Economic Policy and Poverty Unit". UNDP Namibia. Retrieved 10 September 2013. Wikimedia Commons haes media relatit tae Namibia. This page wis last eeditit on 26 October 2018, at 20:38.